Aw, HELL yeah! 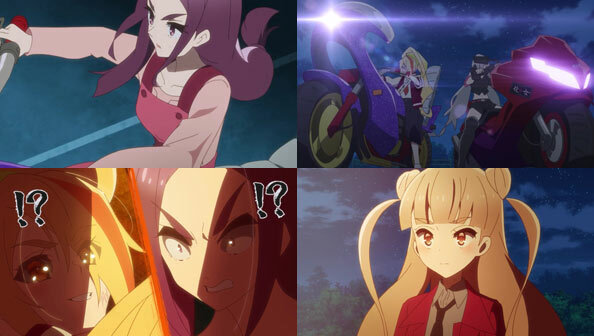 Saki is probably my favorite idol in Zombieland Saga, so I’ve been awaiting the telling of her backstory with great anticipation. That telling finally comes this week which opens with her and her right-hand woman Kirishima Reiko having just finished conquering another rival bike gang way back in 1997. Fast-forward to the present, and Tatsumi deploys Franchouchou to a public park to practice the Kashima dance with some old folks. Since the elderly make up the vast majority of Saga’s population, gaining them as one of their fanbases is key. And as the idols discover, the fogies have quite the moves once they switch on the cassette tape. Their dancing actually attracts the attention of one Kirishima Maria, who along with her two henchgirls, wears the same long red coats as Saki and Reiko back in the day. 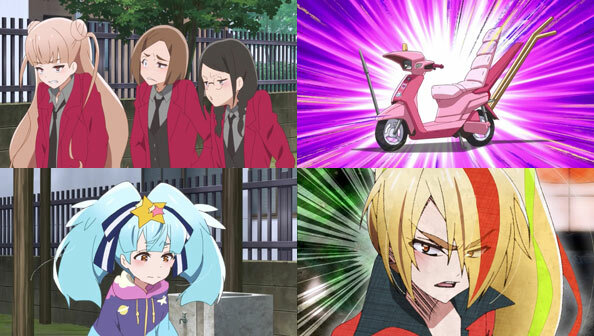 It would seem Saki’s bike gang Dorami is still alive and well, but in a kind stunted, pee-wee state (even Lily critiques Maria’s ride, a pink scooter, as lame). 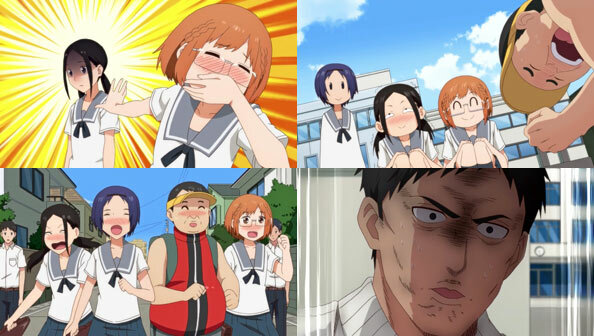 Against Sakura and Lily, who don’t want any trouble, Maria and her goons believe they have the upper hand…until Tae bites one of Maria’s buns. Then Saki shows up, and all it takes is a glare and grunt to scare Maria off. After all, Saki’s the genuine article and they’re just wannabe poseurs. 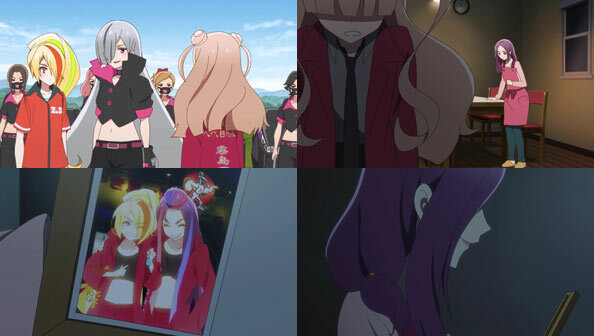 Maria’s eyes remind Saki of Reiko’s, and that connection is confirmed when Maria comes home. Reiko is no longer in the game, having gotten married and had Maria as part of wanting to live a “normal life”, something Saki never knew anything about, and never got to experience. 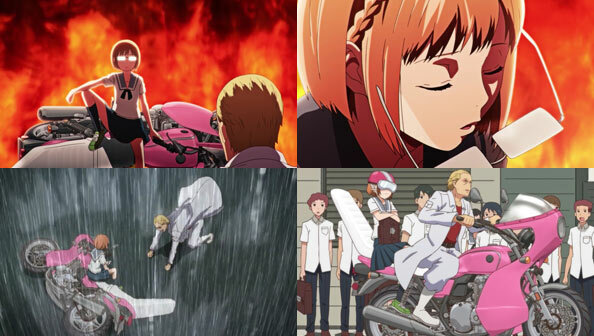 Saki died riding her bike off a mountain road while playing a game of chicken with Korosuke’s then-leader. She won the game, since she never hit the brakes, but paid for it with her life, and Reiko lost her best friend. When Reiko discovers Maria has snuck out of the house to answer a fresh challenge from Korosuke (which involves an identical game of chicken) she dusts off her steed and hits the road to stop it. She doesn’t care how embarrassed her daughter gets; she’s not going to let her end up like Saki. Saki also heads out to intervene (hilariously all she has is a bicycle, so she’s a little late), and ends up reuniting with Reiko, but when she recognizes her as Saki, she pretends not to know who she’s talking about. Saki appoints herself “Captain for a Day” and assumes the Korosuke challenge, sparing Maria from participating. And since she’s already dead, she can replicate the fiery crash that made her a legend. When she emerges unharmed from the flaming wreckage, Reiko slugs her, showing a side Maria had never seen. Turns out she has guts after all…and always did. Only she wasn’t a legend; not really. All the dangerous stuff Dorami and Korosue are doing is nothing more than cheating death, and it’s only a matter of time before Death decides to settle the score. 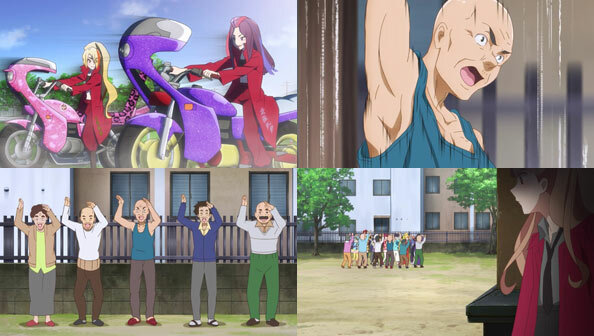 Instead, Saki invites Maria, Korosuke, and the old folks to a concert where she and the rest of Franchouchou put on a dynamic biker gang-themed show. When another telekinetic middle school-aged girl suddenly appears naked in the street at night, then promptly dispatches the entire bike gang whose path she barred, it occurred to me we could get a new super-powered egg brat every week. It also occurred to me that might be too many brats, but this episode would come to allay my fears. 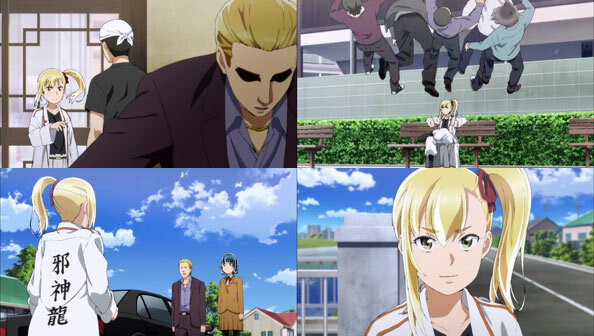 This latest one, Anzu, is not only a problem because she didn’t materialize in the apartment of one a mild-mannered and reasonable yakuza, but because she is on a specific mission to find and eliminate Hina. All Anzu says its that it’s “orders from the brass”, but the less we know about where Hina and Anzu come from, the better, I say. The whys and wherefores aren’t necessary; just the fact that they’re here, and Nitta has to deal with it in a responsible way. Nitta first hears about a little girl taking out the bike gang from his subordinate Sabu, but it isn’t long before she’s at the same ramen shop trying to dine and dash. Nitta pays for her, again placing the responsibility for an extremely powerful and dangerous being on his admittedly broad shoulders. Nitta realizes that by treating the arrival of Hina the way he has, he may well have saved the nation, a fact he casually remarks to Sabu (who can’t possibly know what he’s talking about). He doesn’t shrink from his duty to save it again, this time from a potentially cataclysmic battle between two unchecked adolescent espers. Once he gets a tip about Anzu’s position from Sabu via the network of homeless they pay to keep their eyes and ears open, he brings Anzu and Hina together, but gets Anzu to agree to a game of “look-that-way” rock-paper-scissors, with the two using their powers to try to make the other look in a certain direction. Not only does the execution of this plan eliminate the threat of cataclysm, it also results in some seriously hilarious faces from Hina and Anzu as they try to force-pull each others faces up, down, and to the side. Ultimately, Hina defeats a frustrated Anzu with ease, but when Anzu realizes how much Hina has changed since they last met (she talks and everything! 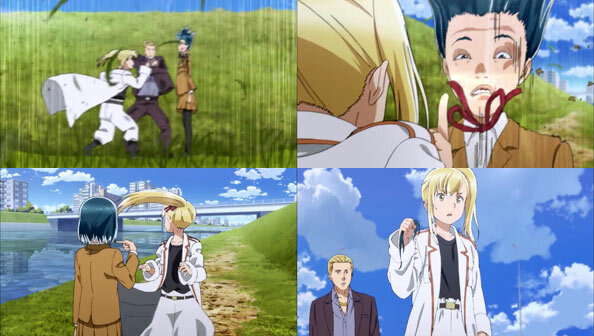 ), she decides it’s enough to take a lock of her hair and tell the bosses that the deed is done. Hina, in turn, invites Anzu to hang out a bit before she returns home (wherever that is; I don’t want to know). 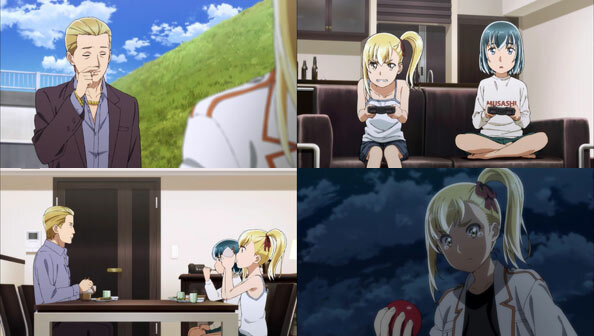 After some video games, dinner, and a load of laundry, Hina and Nitta send Anzu on her way…only for her red ball teleporter thingy to not function because it was in the wash, leaving Anzu stranded and homeless (again). Maybe this time gangs will keep a wider berth. 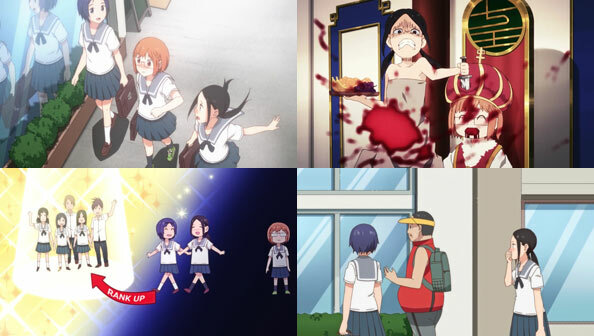 While this leaves open the possibility Hina and Anzu will cross paths again, and I wouldn’t mind such crossings, she doesn’t wear out her welcome here, and isn’t present in the episode’s second half, in which Nitta realizes that ever since he took in Hina, he’s been off his Game. 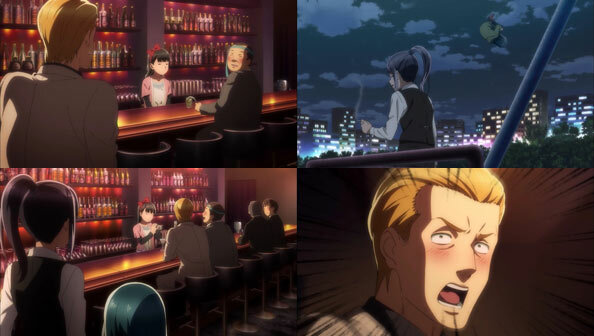 His bartender/occasional date Utako thinks he’s joking when he asks her out with Hina sitting nearby; his usual girls at the girly club have heard rumors he’s put his Don Juaning on hold in order to lavish time, love, attention and money on his “daughter.” Nitta is appalled. He’s got to get his game back. He does so in a less-than-subtle way, essentially ripping the time-consuming Hina off like a band-aid, leaving her alone in the apartment with a cold can of mackerel while he hits the bar or club or goes out on dates. Hina finds the mackerel novel and tasty at first, but soon it gets old and tedious, and she doesn’t like the loneliness. 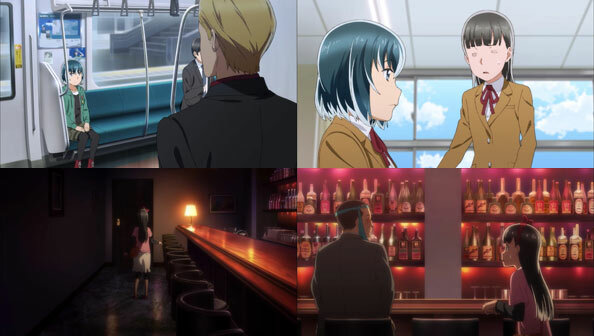 Hina decides to take matters into her own hands, first by insisting she get to go out with him (resulting in a hilarious chase in which she’s waiting for him on the subway at the end, and he lets the doors close without getting in) to enlisting the aid of her too-nice-for-her-own-good classmate Hitomi. Hina learned from TV it’s better to use more than one person to follow someone, but she promptly ditches Hitomi at Utako’s bar, which is closed. There’s a distinct feeling of not belonging in such an adult place, yet when one of the regular lushes lumbers in to tie one on, he’s no so much confused as delighted that the new barkeep is so young. He doesn’t even mind she doesn’t know how to make a highball; he’ll teach her. 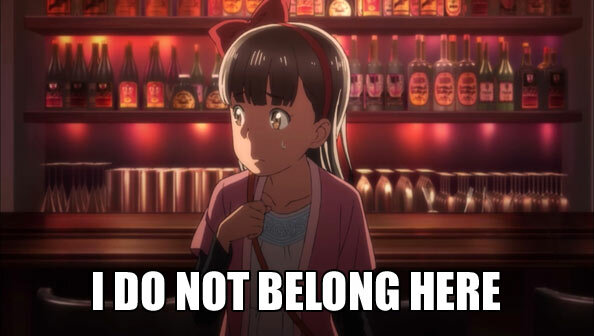 And thus Hitomi, who as I said is way too nice to turn down an old drunk man’s offer to teach her how to make cocktails for him, ends up tending bar all night. When Nitta finally shows up, she’s relieved, but when she calls him Hina’s “dad” he gets upset and becomes another customer (rather than rescuing her). Meanwhile, Utako ends up crossing paths with Hina, and tells her Nitta won’t understand what she wants unless she tells him straight up. It’s a great little playground scene that’s made more “Hinamatsuri-ish” by the fact Hina levitates off the swing and does a few lazy flips in the air while Utako is dispensing advice. By the time Utako and Hina get to the bar, Hitomi has, just, like, become a bartender. 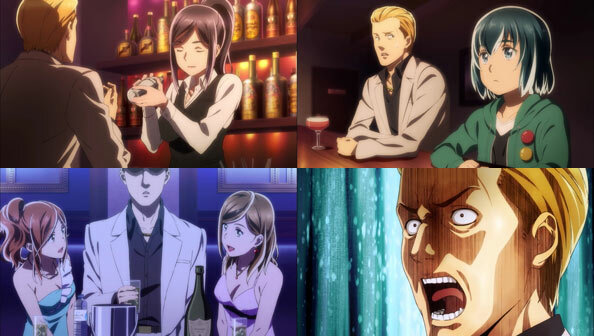 I didn’t think I’d ever come across an anime not only in which a middle schooler is ditched in a closed bar, but accidentally becomes a thoroughly competent bartender over the course of an evening, without even particularly wanting to! It is ludicrous and amazing. And there, to a somewhat sloshed Nitta, Hina tells him straight-up what she wants: to go to a girly club with him. In’s an odd request, but Nitta gives in to the booze-lubricated mood of the room and agrees. 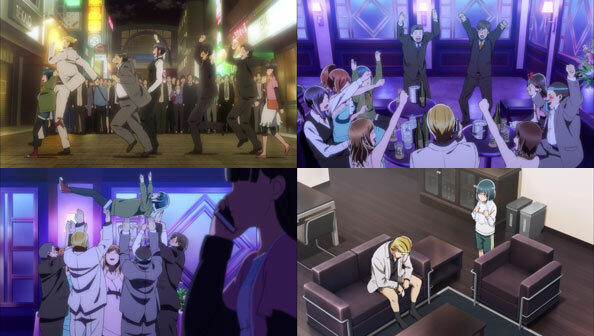 But rather than just Nitta and Hina, everyone comes along: Utako closes the bar and comes, the regular drunk comes, a comple random salarymen come…and Hitomi comes too. The increasingly drunk Nitta even lets Hina levitate a bottle of champagne over a tower of glasses (even though such a service has to be specially ordered). 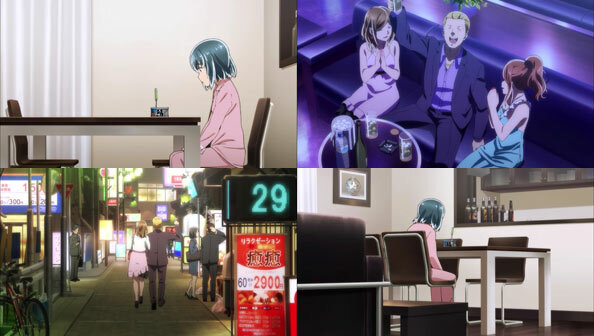 Finally, Hitomi gets a call from her worried-sick mother, who doesn’t believe her for a second when she tells the truth about where she is so late at night. The question Hitomi wants answered is why is she there. I can think of two main reasons: Hina, and passivity. In the morning Nitta wakes up on the couch, in his boxers, with a hangover, an invoice for 2.5 million yen ($23,000) and a Hina eager to go out that night and do it all over again. Nitta pumps the brakes; from that day until further notice it will be a frugal household. Break out the mackerel!